Experience pure decadence in three premiere, luxury game lodges- Sabi Sabi Earth Lodge, Kapama Karula Lodge and the magnificent Singita Lebombo! 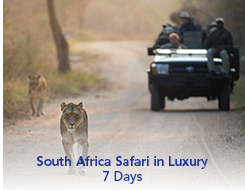 Experience the thrill of game viewing in private reserves unlike any other in South Africa. This luxury tour spares nothing for the discerning traveler seeking the very best in accommodations, service, culinary delights and the bespoke safari experience. Morning departure from Johannesburg. Scheduled Federal Air flight direct from Johannesburg to Sabi Sabi Airstrip. From here it’s a short drive to Sabi Sabi Earth Lodge located on the Sabi Sand Private Game Reserve. Enjoy a 2 night stay at Sabi Sabi Earth Lodge with all meals, select beverages and morning and afternoon/evening game drives and bush walks. Sabi Sabi Earth Lodge is a unique luxury game lodge, nestled in the bush and inspired by Earth Shelter Architecture from the Middle-Ages. Its organic architecture literally merges with the environment, creating an earthy vitality that pervades every room. It is, quite simply, a luxurious wilderness retreat, and a one of a kind, breaking from the traditional style of lodges to set a new standard. Earth Lodge comprises a superb wine cellar, the Earth Nature Spa, with a range of treatments, a secluded library, art gallery and meditation garden, as well as a boutique curio shop, and dining area. Each luxurious suite has its own plunge pool, mini bar, air-conditioning, bathroom with indoor and outdoor shower, and an uninterrupted view of the African bush. The lodge offers a butler service, and in-room dining can be arranged as a special request. Enjoy one last early morning game drive at Sabi Sabi. Transfer to the Sabi Sabi Airstrip. Federal Air flight to Hoedspruit Airport. From here it’s a short drive to Karula Lodge located on the Kapama Private Game Reserve. Enjoy a 2 night stay at Kapama Karula with all meals, select drinks and morning and afternoon/evening game drives. Set on the banks of the perennial Klaserie River is the reserve's most secluded and prestigious lodge, Kapama Karula. Meaning place of peace, Kapama Karula exudes calmness and depicts the pinnacle of luxury five-star safari accommodation. Each of the ten Superior Suites measure at least 90 square metres each, with an opulent full en-suite bathroom featuring indoor and outdoor showers. Each suite has a fully stocked minibar, Nespresso coffee machine, Wi-Fi and an iPod docking station. For guest comfort, each suite has air conditioning, as well as a gas-heated fireplace. The Superior Suites are wrapped by glass sliding doors, which enable seamless views over the Klaserie River. Each suite also has its own deck area, with a full-size heated swimming pool. Early morning game drive. Short transfer to Hoedspruit Airport. Federal Air flight from Hoedspruit to Satara Airstrip. From here it’s a short transfer to Singita Lebombo located on a private concession within the Kruger National Park. Enjoy a 2 night stay at Singita Kruger Park Lebombo with all meals, select drinks, morning and afternoon/evening game drives, bush walks, mountain biking and archery. Situated on an exclusive 58 square-mile private concession east of Satara on the remote eastern boundary of Kruger National Park is Singita Lebombo, designed with the premise of treading the earth lightly and boasting a high concentration of wildlife. Setting new standards in contemporary game lodge luxury with service excellence, luxurious accommodation and fine cuisine, you are sure to have an unrivalled, exclusive wilderness experience. The lodge features access to a world-class wine cellar and a village featuring a gym and state-of-the-art health spa, a gallery and the finest African jewelry and artifacts. The spectacular scenery, varied landscape and large herds of game create an exceptional game viewing for Singita Lebombo guests. Each suite has sweeping views of the Lebombo Mountain ridges and surrounding bush. Federal Air flight from Satara Airstrip to Johannesburg arriving mid afternoon.